The Maximum Yield strategy with 21.58% return. The NASDAQ 100 strategy with 15.00% return. The Leveraged Universal strategy with 13.02% return. SPY, the S&P500 ETF, returned 5.92%. Try our QUANTtrader software with our 30-day free trial. There is no better way to understand how our strategies work. Join our new QUANTtrader forum were users dare adjust the strategies and share new ones! Check our new European section. Our in-depth 2-hour QUANTtrader webinar, with Frank Grossmann. Get a behind-the-scenes look at our strategies. We updated our web-site home page and menu. For the second time in three months, the Federal Reserve increased its benchmark interest rate a quarter point taking the overnight funds rate to a target range of 0.75 percent to 1 percent. Treasuries had small comeback since then signalling that the market had already priced in the Fed move and was bracing for a much more hawkish tone. Treasuries are once again negatively correlated to the equity market which is a positive for our strategies. 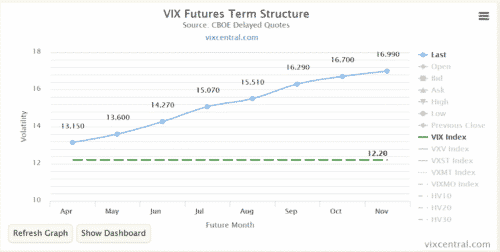 The market is expecting two more hikes, in June and December. Volatility continues to be extremely at low levels, sending the ZIV etf (medium term inverse VIX etf) and our Maximum Yield strategy to new highs. 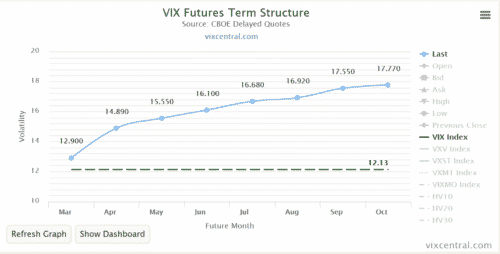 Just like last month, what is interesting is the unnaturally low expectation of future volatility, with 8-month out VIX futures being below the 17 price level. This continuing “flattening” of the curve is unusual. In plain terms, future expected volatility levels seem to be low even though we are looking at upcoming French elections, Brexit negotiations as well as U.S. policy uncertainties. Investors seem fearless as the U.S. market is still at the top of the price chart. Investors may want to start looking at assets and ETFs that may present a bigger opportunity for growth. To keep things in percpective, this past month the top performers were Mexico (+12%), Spain (+11%), Chile (+8%) and Italy (+8%). Having said that, our top 3 strategies are still U.S. market based and have achieved returns above 13% in just 3 months. Our Maximum Yield strategy, has returned an additional 5.81% in March, bringing year-to-date returns to 21.58%. Our 3x UIS strategy lost 0.83% to remain close to 13%, while our Nasdaq 100 added 3.34% to reach 15.00% YTD. Our Bond Rotation strategy continues to be a solid performer returning +4.11% for the year. For those that prefer access to gold in a conservative strategy, the BUG (our version of the enhanced Permanent Portfolios) continues to benefit from a rally in foreign bonds and convertibles returning 4.14% with very little volatility. We wish you a healthy and prosperous 2017.